One of the initiators of “Slow Spicy Curatorial Practices“, Kaspar König, will join fellow musician Fabian Gutscher to present a tele-concert. The music will be conducted & mixed by Kaspar König in Hong Kong and Fabian Gutscher in Zurich. 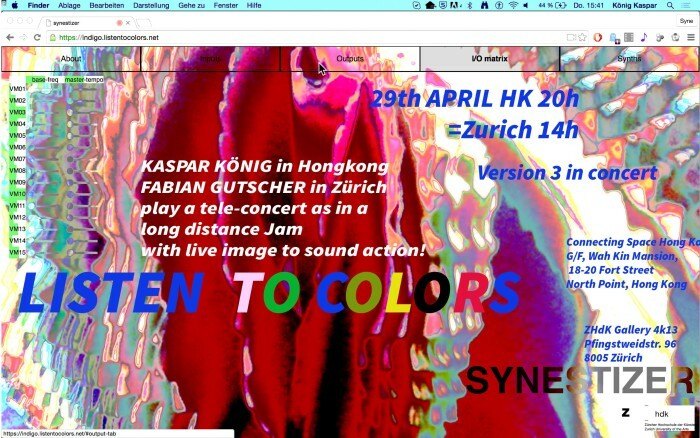 Kaspar König will perform his newest version of the www.Synestizer.com or listentocolors.net. These Webinstruments are made to make webcam images audible. This is a highly experimental type of sound which is intertwining your eyes and ears at the same time. Fabian Gutscher will play his motorized syntesizer and images and sounds are shared over distance. This concert is set to open up the acoustic environment all workshop participants (especially Soundpocket and Nudd participants). Participants are very much invited to bring their own sound, sounding object or instrument to play in the second part of the concert. Donate to Curate – a project lead by the transdisciplinary group “Slow Spicy Curatorial Practices” in the framework of Connecting Spaces Hong Kong – Zurich at Zurich University of the Arts (ZHdK) – is part of Manifesta 11, The European Biennial of Contemporary Art which 2016 is hosted by the City of Zurich and entitled What People Do For Money: Some Joint Ventures. The project will take place on a fallow ground nearby the ZHdK, in the middle of a new commercial zone of the former industrial part of the city. The basic infrastructure will be made of waste and recycled materials and is thought as a shelter for people, artistic practices and events. We are looking for artistic, social and collaborative projects to be realized in summer 2016.